36.71 Вт⋅ч литий-полимерн., Автономная работа (сведения производителя): 10 час. Выпуск третьего поколения самого большого планшета Apple прошел под знаменем масштабного редизайна, в результате чего iPad стал больше похож на iPhone XS, чем на своих предшественников. Новинка заметно подросла не только в цене, но и технологически: в планшете теперь установлен самый мощный чипсет от Apple, система Face ID, объемный внутренний накопитель, есть поддержка Apple Pencil и много других вкусностей. Пока же новый iPad Pro выглядит богатырем, которому некоторые подвиги удаются на ура (кстати, для этих подвигов все же лучше подойдет 12,9-дюймовая модель), а к другим он не может приступить, потому что оказывается внезапно связан по рукам и ногам. И сдерживающие его путы — это операционная система, при разработке которой все, похоже, беспокоились в первую очередь о пользователях смартфонов, и лишь по остаточному принципу — о тех, кому нужна портативная и мощная "планшетная" замена компьютера. А ведь кому-то из них может вдруг взбрести в голову скопировать на свой новый мощный тысячедолларовый "компьютер" файлы прямо с флешки. The iPad Pro is the quintessential tablet for power users and creative pros. It's so fast that I imagine the likes of Qualcomm and Intel are getting nervous. This tablet wiped the floor with premium Windows laptops and 2-in-1s, in both benchmarks and real-world tests. The iPad Pro's display, sound and battery life are also top-notch, and the improved Apple Pencil is more comfortable and easier to store. Apple already dominates the tablet game, but it is clearly setting its iPad up for bigger things. It wants you to replace your old laptop with the iPad Pro, but that the same time it's keeping the tablet on a leash. Depending on how you use your laptop, the iPad Pro can be the perfect replacement or it can get close to it. 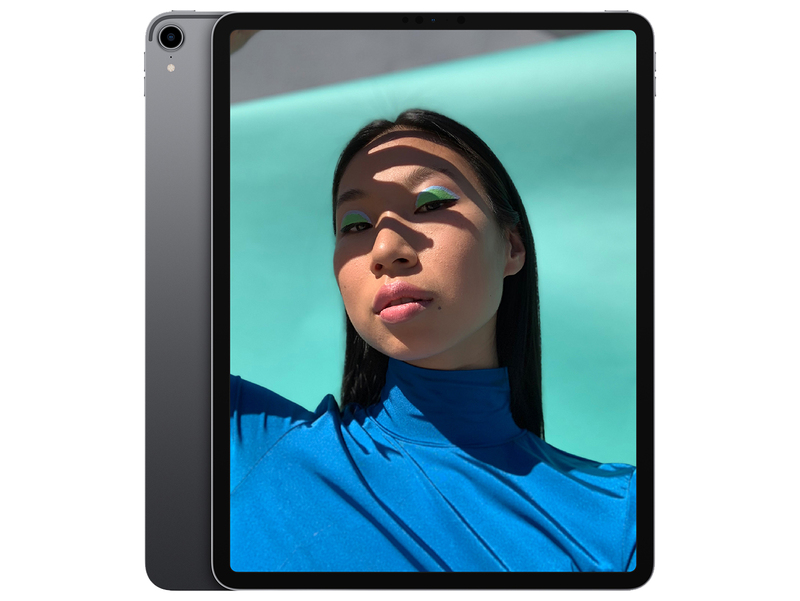 The new iPad Pro 12.9 inch is amazingly powerful, outperforming laptops with Core i7 processors while offering a thinner and lighter full-screen design. Power users, please look elsewhere - Samsung and Microsoft got you covered if you are after a cutting-edge Android or Windows device. But those who won't use the iPad for work should definitely consider one. Because no matter how Apple tries to advertise the iPads as versatile tablets, they are excellent mostly for fun - games, videos, music, social networks, and some occasional blogging or vlogging. The 2018 Apple iPad Pro is a phenomenal tablet that feels fantastic to use, with even more potential in the future. But it’s the same price as laptops that may suit you better if you're after a pro machine right now. The newest iPad Pro has some impressive business features. Its battery life, crisp Liquid Retina display and new Apple Pencil make it a worthwhile product for business owners and entrepreneurs. The USB-C compatibility means you can use it to work on and then deliver presentations on the go. This is a versatile business tool, but it's no replacement for a typical laptop. The 12.9in iPad Pro is maddeningly close to being a genuine laptop-killer, but the half-hearted implementation of USB-C support cuts off a lot of its potential versatility. Having said that, it's still the best iPad Apple has ever made - and the world's greatest tablet, to boot. The iPad Pro is a high-powered slate with a fantastic design and almost extravagantly large near edge-to-edge display. The new Apple Pencil is a wonderful accessory for the more artistically inclined, while the Smart Keyboard Folio makes for a genuinely solid typing experience. The iPad Pro 12.9 for 2018 is a truly amazing device with a lot going for it including the overhauled design. We love the way it looks in a more compact chassis and you'll get used to Face ID and the new gestures. But I can’t bring myself to believe this power lead many potential first-time buyers to abandon MacBooks or PCs for this scrappy machine. The limitations prove crippling. Let’s put it this way: I’ve written this whole review on the iPad Pro itself, but now I’m going to switch back over to my MacBook to edit it. And that, my friends, is a shame. For the last couple of years, Apple has slowly but steadily been increasing the price of many of its products, almost as if it's looking to see how much (more) people are willing to pay for the latest and greatest hardware. We've seen that with many products, big and small. Last year's iPhone X was arguably the biggest such experiment, and as we now know, it was a huge success. The iPad Pro is as powerful as a computer and can even complete common computing tasks with ease. But it's still a tablet with software issues and a largely mobile experience. 84% iPad Pro 12.9 review (2018): The future of computing? Don’t be fooled by its new, even more minimalist design: Apple’s revamped 12.9-inch iPad Pro is overkill, plain and simple. We have a few things for thank for that, like the absurdly fast A12X Bionic chipset (which actually runs faster than some of the full-blown PCs in our office) and the fact that you can now pay for up to 1TB of onboard storage. And let’s not forget Apple’s decision to include a USB-C port instead of its classic Lightning connector — not only does it make it easier to augment the iPad with additional accessories, it also means the Pro can be used to tackle different kinds of tasks more easily. It’s the first iPad we’ve ever tested that could actually potentially replace a traditional computer in someone’s life. That said, shortcomings in iOS and a lack of optimized software mean that this iPad’s best days are still to come. This isn't just about improving the apps they have in art and design. For the iPad Pro to truly be the equal of a laptop, we need to start to see UX, graphic design, 3D and animation apps coming across to it – and CG especially requires extreme performance. And these new iPad Pros may just be powerful enough to deliver it. But not as big a mistake as assuming the only “real” computers run macOS. Because the iPad Pro is a real computer. And a really good one, too. If you think about it, even the latest notebooks today are compromised machines. If we want something thin and light, we have to sacrifice performance. And if we want performance, we have to be ready to lug a heavy machine around. But the new iPad Pro doesn’t hold to these aphorisms. There’s no compromise. It blends superlative performance into a thin and light body. It is a tablet with no equal. If you can afford it, this is the best tablet available right now. The only question is if it fits your lifestyle, needs, and usage patterns. If it does, I think you will be very pleased with the new iPad Pro. For pro use, the new iPad Pro is amazing, held back by iOS 12 rather than any hardware constraints. Yes, it’s expensive, but it’s also more powerful than most MacBooks — and has a better screen than all of them. If the iPad Pro had a clamshell keyboard design, and ran macOS, it would certainly cost a lot more. For people who really use the iPad, the answer is obvious. You should buy one. Is the new iPad Pro a stunning engineering achievement? Without question. Has Apple once again produced mobile hardware that puts the rest of the industry to shame when it comes to performance, battery life, and design? Yep. Is the iPad Pro the best, most capable iPad ever made? It certainly is. However anybody can take notes — how is the brand new Pencil for drawing and sketching? I met up with New Yorker and CBS Information cartoonist and journalist Liza Donnelly to see what she thought. She’s labored with the iPad and 53’s Paper app to do dwell sketches throughout information moments, creating on-the-fly sketch-based journalism. Watching her work on it, it impressed on me how good Pencil is. The larger of the new iPads is the one that will impress the most in the hand, but when you dig into the spec sheet and compare the cost you may find yourself with a difficult decision to make. There's a lot of power here and a lot to like, although the inherent multi-tasking limitations may make this a hard sell over a dedicated notebook. For creatives though, the iPad Pro offers a lot of options and flexibility. Apple iPad Pro 12.9 2018 Sinnvoller als ein Macbook? 86% Mal eben die Notebooks in die Tasche stecken? Recensione iPad Pro 12,9: il confine sottile tra tablet e notebook...ma che prezzo!